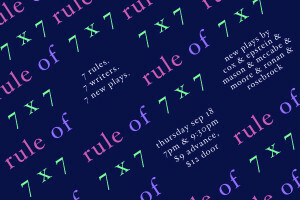 Rule of 7×7 tix now on sale! The 7th RULE OF 7×7 is here! Seven 10-minute plays each adhering to the same set of rules. **All tickets include a free drink! Featuring new plays by myself, Matt Cox, Rachael Mason, Dan McCabe, Seth Moore, Jeff Ronan & Abby Rosebrock!